The Quest Max electric folding bike is perfect for those who want an ultra-compact form and plenty of pedal assistance on hilly terrain. Its powerful 350W mid-drive motor has enough torque to tackle any hill with ease. A factory-sealed NuVinci® transmission and Gates belt drive ensure a smooth and virtually maintenance-free riding experience. It is truly the best of both worlds! The Quest Max, featuring a powerful 350W mid-drive motor coupled with a maintenance-free Gates belt drive, delivers a smooth riding experience up any hill. The NuVinci continuously variable transmission makes shifting a breeze, even from a full stop. Its easy-to-use folding mechanism makes the Quest Max ultra-compact and highly portable. 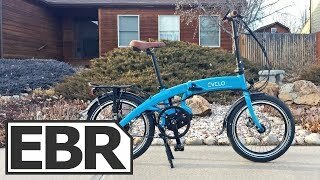 All things considered, this is an amazing folding electric bike! 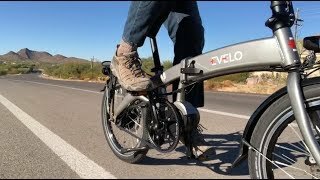 This is one of the few folding electric bikes that offer the unique combination of a quality mid-motor with a belt drive and CVT hub. 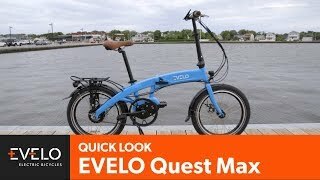 Overall the EVELO Quest Max is a compact, nimble, versatile, and portable eBike that has a stable ride feel. Its mid drive motor and high-tech drivetrain give it many of the performance features found on full size eBikes. The Quest Max features an easy-to-use and dependable folding mechanism. The bike folds in less than 30 seconds, takes up just 18” (W) x 35” (L) x 29″ (H) of space folded and can be stored virtually anywhere. Its compact form makes it easy to transport. Whether you live in a small city apartment or are planning to take your Quest Max on a bike or RV trip, this electric folder is a smart choice for tight spaces. Recommended for riders up to 250 lbs. 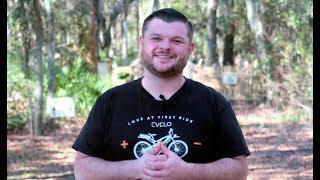 Larger riders can be accommodated – contact us for details.